Is there any way to restore a backup from inside VS 2012? I have a backup of a DB from another server and would like to restore it to my DB on my machine locally. You have a couple of options. Assuming your are using SSDT, you could simply hit the SQL menu, Transact-SQL Editor, New Query. 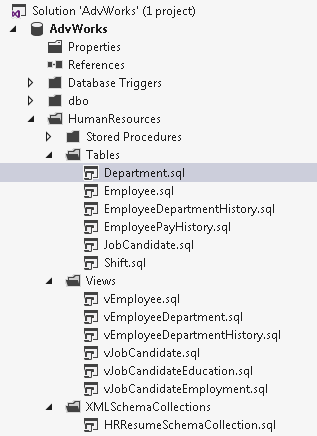 Then you can enter standard T-SQL commands to restore a database, just like you might in SQL Server Mangement Studio. If you want menu choices, there isn’t one to restore from in Visual Studio, you’ll need to use SQL Server Management Studio. If you need to import a database, as opposed to doing a restore, there is a way to get the Schemas in place with Visual Studio using SSDT. In the SQL menu, do a Schema Compare (this will be the subject of an upcoming blog post). 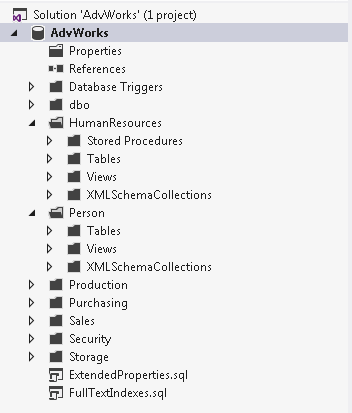 With it you can copy the structures from one database to another. Note, this only covers the structures, not the data itself. Right now SSDT doesn’t have an option for data comparisons. If you still have VS2010, or 2008 for that matter, and have the VS Database Projects, there is an option in it to do data comparisons. This is a great feature, and will let you get the data from one database in sync with another. Note that this really isn’t meant to do full database backups and restore, so it’s not the fastest in the world. It’s more designed for situations like having a “gold standard” test database, one that has all the proper conditions for performing unit tests, and getting your actual test database back in sync after running said tests. 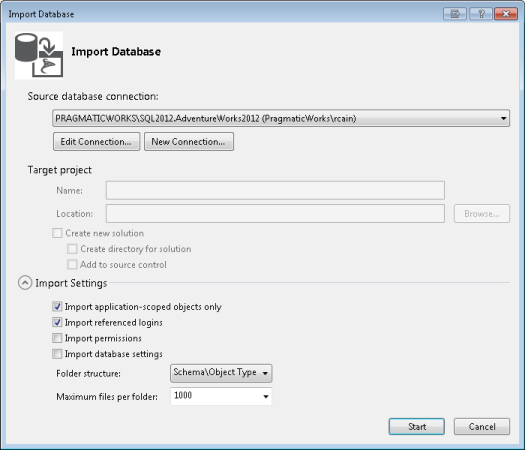 By far though the simplest method is to just use SQL Server Mangement Studio. When I do development I generally have both open. Hope this gives you some ideas, stay tuned each Tue and Thr over the next few weeks will be blog posts on Visual Studio SSDT in VS2012. I’ll also be speaking on the subject at devLink in Chattanooga, in just a few weeks.